In 1854, there was an outbreak of cholera in London’s Soho area – a disease that had killed millions of people across the world. A doctor called John Snow decided to work out where the disease came from and how it spread. People thought it was spread through the air like flu, but John Snow didn’t believe this. He thought people caught the disease by eating or drinking something bad. He marked the houses where people had caught cholera on a map. 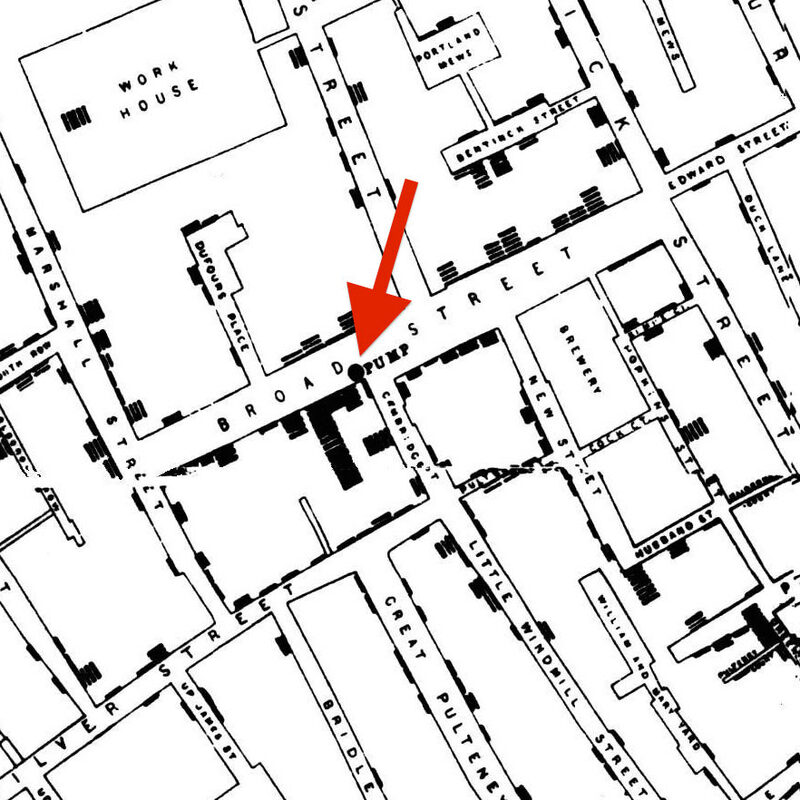 Then looking at the map he saw that most of the cases were round a public water pump on Broad Street (now called Broadwick Street.) There also weren’t any cases at buildings that had their own water supply, or at a nearby brewery (where the people drank mostly beer). The map John Snow used. The black bars show where people had caught cholera. We’ve drawn an arrow pointing to the pump. His evidence was so convincing, the local council removed the handle from the water pump the next day, and the spread of cholera stopped. That showed he had been right—cholera was spread by drinking infected water. It turned out that the pump had been built near an old open toilet, which had begun to leak. John Snow paved the way for disease mapping, or epidemiology, helping us find infection sites quicker and doctors to plan patient treatment faster. Nowadays, computers are used to do this even more effectively.